Notes: This movie was the first in which director Makoto Shinkai worked with a full team of animators and artists, although the directing, writing, and storyboards were all still done by him. Shinkai later released his own novelization of the movie, which expands upon the story, and a two-volume manga adaptation illustrated by Yukiko Seike ran in 2010. It's worth noting that the main events of this movie (which center around separation and two lovers slowly growing apart) happen during the early 1990's, when neither cell-phones nor email were widespread. Apparently, the title refers to the speed at which cherry blossoms fall. Given the role of cherry blossoms in this movie, and in Japanese culture in general, the title fits. Takaki Tono befriends Akari Shinohara when she transfers to his elementary school. The two quickly become close, but when the two graduate, Akari is forced to move again because of her parents' jobs, and Takaki soon discovers that he'll also be moving to a place where the traveling distance will prevent the two from seeing each other at all. This movie consists of three segments, the first of which depicts their initial friendship and separation, the second of which shows Takaki's lonely high school life, and the last of which centers on their respective lives as young adults, all tied together by observations on memory and the slow march of time. Makoto Shinkai's biggest talents are his computer animation hacks and his ability to make you experience the same feelings of nostalgia and longing that his characters do. His style is hard to mistake, and while his movies lack much in the way of strong character development, I know I'm definitely not the only anime fan who's enjoyed the experience brought about by his combination of breathtaking astral vistas, wistful narration, and lovelorn protagonists. But I'll want a director to challenge himself or herself after making so many movies whose tone, themes, and basic structure are so similar, and I definitely value growth and risk-taking when judging directors. 5 Centimeters Per Second, Shinkai's 2nd feature film, spends the first third getting the kinks out of his old formula and polishing it to near perfection before collapsing under weak character development and a frustrating ending. More than anything though, my problem with it is that it feels complacent. As moving as parts of this movie were to me, Shinkai's told the same story of star-crossed lovers in literally all of his movies and OAVs up to this point, and 5 Centimeters Per Second wears thin because of this. If there's one consistent aspect of Shinkai's repertoire that I like, it's the brilliance of his art. In 5 Centimeters Per Second, he continues to use expansive vistas and bright, detailed starscapes to give an ethereal sheen to scenes such as train rides across snowy plains and summer evenings spent walking down remote country roads. His color scheme is permeated by a warm but lonely quality that no other animator achieves, and such touches as the contrast between the sheen of the characters' bright, cherry blossom-filled childhood days and the cold and alien glow of the snowy wilderness Takaki travels through during his attempt to reconnect work wonderfully to highlight the story's progression. 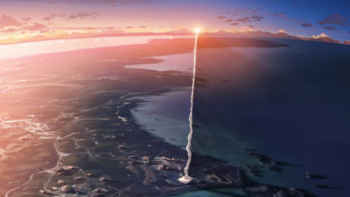 It's a movie in which I felt reminded of Earth's beauty and inspired by one person's interpretation of that beauty and its perception, and even the least interesting moments were often saved by this. Meanwhile, the majority of the score is performed by Tenmon, a friend and frequent collaborator of Shinkai's whose piano and light orchestration merge beautifully with the soft-spoken dialogue. 5 Centimeters Per Second remains as kind on the senses as any of Shinkai's other works; it really is worth watching for the sights alone, just as even the briefest visit to San Fransisco might be to catch sight of the majesty of the Golden Gate Bridge. Yep, I had to plug my hometown a little bit. 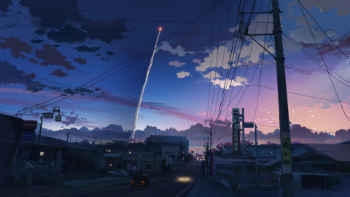 And so for part of its runtime, 5 Centimeters Per Second works perfectly, bringing a stripped-down version of the structure of his past films and nearly escaping their limitations. Aside from an oblique reference in the second segment, the science fiction of Voices of a Distant Star and The Place Promised in Our Early Days is gone; instead, Shinkai's characters appear in what could very well be our own world's version of Japan. Shinkai's films have always drawn their story from a general sense of loss and nostalgia rather than working very strongly with his characters' personalities, leaving his characters likable but a bit bland; whereas the sometimes-overbearing and confusing alternate history of The Place Promised in Our Early Days faltered a bit with a cast of characters who didn't seem quite capable of handling it, the simple storytelling of 5 Centimeters Per Second works much better without that pretense, and the movie feels way more relaxed because of this. 5 Centimeters Per Second has a lot in the way of emotion if not that much in terms of thematic depth, its musings being observational and not feeling too profound to me, but as cynical as I can get, the stark simplicity moved me a lot of the time. The fact that the main characters spend a good amount of time together before being separated helps, a lot, given that the near-total lack of this was one of my least favorite parts of his earlier films. 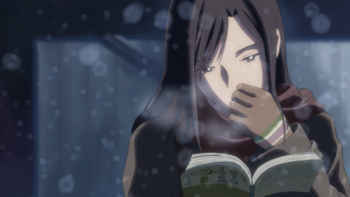 The first segment of 5 Centimeters Per Second is thus touching and rather charming to watch. It's in the next two sections where the real problems start to emerge. When Shinkai's story separates the characters, it breaks the link between them that made their story at all interesting to me, and while it's still possible to empathize with them, most of the rest of 5 Centimeters Per Second just meanders. It's at this point that Shinkai's recurring traits really, really start to get old: his brooding male lead broods, and broods, and becomes very boring to watch, while there's some fluff about a side character fulfilling her dream to become a surfer that feels like something from a dating sim and doesn't fit into the plot, and finally, there are just way, way too many slow, directionless monologues. Speaking of that side character, Kanae, she's a pleasant enough person, but the second section really makes her out to be more relevant to the plot than she actually is. It feels like she was put in to give a third-person perspective to Takaki's loneliness, and to be part of a love triangle, but the person watching the movie has the first of those, already, and she has no real chemistry with Takaki, making the whole thing seem inconsequential. Honestly, the entire second segment lingers on her, but her crush on Takaki never goes anywhere (they hardly even talk, truly), and since she then disappears from the movie, the entire second segment felt like a waste of time, to me. And without spoiling the ending of the third segment, meanwhile, I'll say that it was majorly disappointing for me. The key moment is well-scripted but brought down somewhat by the dual-narration, which, again, Shinkai has now done during the final scene of every single one of his movies, and by another frustrating thing that fellow reviewer Carlos pointed out: it's just not that hard for these characters to reconnect, now, with the internet existing, and thinking about that aspect makes it harder to take this movie seriously. There's then a montage of scenes from the entire movie that caps the story well, but by this point I was just feeling cynical. At the very least, I do like the song, "One More Time, One More Chance" by Masayoshi Yamazaki, that Shinkai uses as the backdrop for the very ending; it's lovely, and I just wish that it had played over a movie that didn't leave me as cold as this one. 5 Centimeters Per Second is a movie I liked but didn't love, in the end. I got impatient with Shinkai's questionable story-writing and his reliance on the exact very same tricks that got him attention for Voices of a Distant Star, and while there's a part of this movie that stands well on its own, the rest is just kind of a mess. At this point in Shinkai's career, I really wouldn't mind him being a bit more willing to take risks. I've seen the man step out of his niche a few times: as his entry to the Ani*Kuri15 anthology shows, he's actually more capable of being funny than I would have guessed, and his featurette She and Her Cat (one of his earlier works) benefits from a complete lack of real drama of any sort and works well as a sort of cinematic tone-poem. I really would rather not be that girl who knocks his reputation as being over-hyped, and he's given the very slightest hints of the versatility he needs for his work to be transcendent. 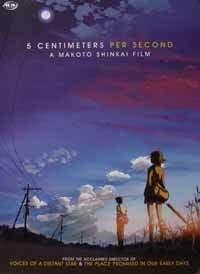 The problem is that 5 Centimeters Per Second doesn't have any of those hints. Recommended Audience: There's no violence, sexual content, profanity, or drug abuse to be seen, although the tone, subject matter, and slow pace of the film will make it more appealing to teenagers and adults than most children.